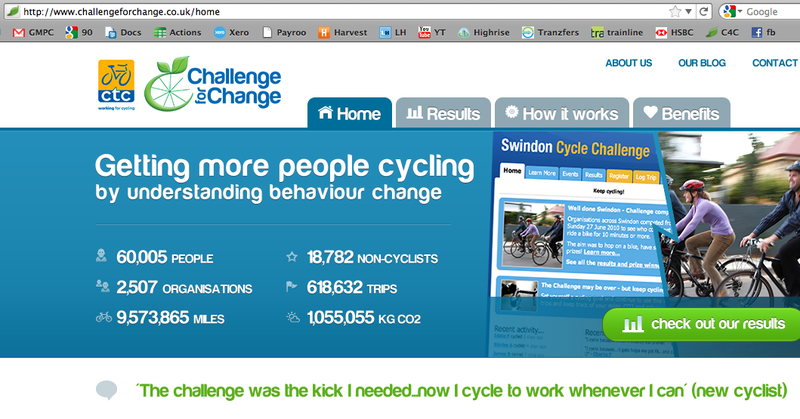 Today, the 60,000th participant of our Cycle Challenge programmes registered on our webtool! What a milestone! This has been achieved by the CTC Challenge for Change team working alongside our partners from local authorities and public health, as well as by our Cycle Champions from the 2,500 participating businesses we’ve worked with from around the world. Pat yourselves on the back everyone! To date we’ve surveyed over 36,000 people in the UK about their cycling, health and travel behaviour as part of our Workplace Cycle Challenge programme. This includes more than 13,000 ‘non-cyclist’ participants. Behaviour change programmes work – 1 in 3 non-cyclist participants (37%) continue to cycle once a week or more after they take part in a Workplace Cycle Challenge. Hills are not a barrier for many non-cyclists – Non-cyclists in hilly areas are almost just as likely to continue to cycle once a week or more than non-cyclists in flat areas (31% vs 37% of non-cyclists continue cycling regularly each week in hilly and flat areas respectively). Behaviour change programmes work even in ‘cycle unfriendly’ areas – Non-cyclists who live in areas that can be classed as ‘neither cycle friendly nor unfriendly’ are just as likely to continue cycling as non-cyclists in areas that are ‘cycle friendly’ (40% and 41% respectively). Where as in ‘cycle unfriendly’ areas it is 27% of non-cyclists who continue to cycle each week, which while is clearly less than 40% is still a good result for a project. If we had the key to open up the heads of people in your area and ask them any questions you liked about cycling, what would you ask? We’re currently re-designing our surveys for our future Challenges, and we would like to get the thoughts and ideas of people who are working to get more people cycling in the UK. Regular Cyclists – people who cycle on 2+ days a week. We’re keen to share the results of our research with people like yourself who are working to design and implement programmes that will encourage more people to cycle, more often and for transport trips. It’s our aim to give you the intelligence to make your job easier and your projects more effective. If you send in an idea by 31 August 2011 then we’ll put you in the draw to win a bottle of New Zealand wine! Thanks for your thoughts and insights. 2010 was a great year and 2011 is off to a good start as well. Last year we ran 18 Challenges and so far this year we’ve run 12. On average 54% of participants are non and occasional cyclists – just the people we want to influence the behaviour of. Analysis of the results of 21 Challenges has revealed the following. 37% of participants who were ‘non-cyclist’ before taking part in the Challenge are now cycling once a week or more often. 43% of ‘occasional cyclists’ are now cycling to work at least once a week. We define ‘non-cyclists’ as people who haven’t cycled in over a year or who have only cycled once or twice in the past 12 months before they took part in the Cycle Challenge. We define ‘occasional cyclists’ as people who were cycling 1 – 3 times a month or about once a week before the Challenge. The above results show that over the years as we’ve run more Challenges (and learned a thing or two in the process) we’re getting better results now than we were even in our highly successful UK pilot in Swindon back in 2008. Looking forward to continuing to bring this successful programme to more towns and cities in the UK, Australia, Europe, North America and beyond! We took a little break from using this blog as a way to promote what do and what we’ve achieved. We launched a new website (http://partners.lovetoride.net/) which superseded the information we had here on this blog.